Nissan is getting bold with their advertising in the U.K.; so bold, in fact, that Porsche has already threatened litigation for unapproved use of their trademark crest. 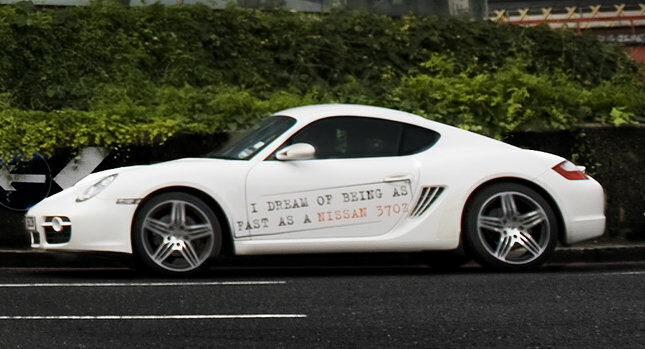 A billboard sponsored by Nissan, displayed at this year’s Goodwood Festival of Speed, featured a 370Z with the Porsche crest, the Audi rings and the BMW roundel. Next to each was chalked up numbers, indicating “kills” by the Nissan. Porsche was none too happy about this, and sent Nissan a cease and desist order in regards to use of the logo. Audi and BMW, meanwhile, just smiled and enjoyed the free advertising. Nissan’s at it again, this time using an Audi TT and a Porsche Cayman to patrol the streets of London. 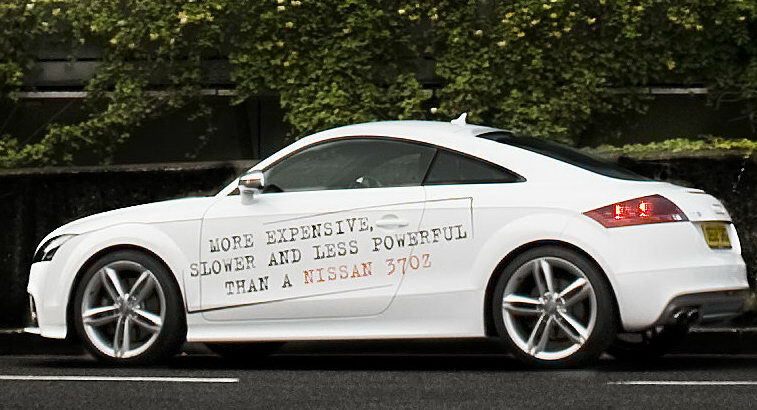 As you can see from the above photos, Nissan happily points out that each is slower and more expensive than a Nissan 370Z. I won’t argue with the less expensive part, because it is nearly impossible to beat a 370Z in terms of value for the dollar (or Pound Sterling, in this case). The performance numbers, at least against the Audi TT, could go either way. As Carscoop reports, Nissan claims a 0 to 100 kph (62 mph) time of 5.3 seconds for the 370Z, and gives the Audi TT a time of 5.4 seconds. That makes the dogfight too close to call in my book, and I’d certainly give the nod to the Audi in the wet weather. Nissan is also strangely silent about lap times: the 370 is very good, but so is the Porsche Cayman in anything but a drag race. That said, I give credit to Nissan for bold advertising, and I wonder when they’ll bring as bold a campaign to this side of the pond.